Fish accounts for 13 percent of Namibia’s export earnings. It is cold in the fish sorting room at the Seawork fish processing plant at Walvis Bay in Namibia. Berta Kamwi is clad in Wellington boots, down jacket and rubber apron. With speed and precision, she runs her knife over a half-frozen hake removing its head and tail. It is evidently a job that brings her some satisfaction. "I’m proud of what I’m doing here. I have experience of more than eight years in fishing industry. It’s how I’m paying the school fees for my kids and my accommodation," she told DW. Fish is one of Namibia’s most important exports. The country sells 373 thousand tons abroad every year, most of it to countries in Europe. Fish accounts for 13 percent of Namibia’s export earnings. According to Peter Pahl, Seawork’s general manager, they are benefitting from a very strong market. "The Europeans want more and more fish from us, which is, of course, fantastic news for Namibia," he said. Fishing is a profitable business for Namibia because the European Union permits ACP states to export their goods to the EU without paying tariffs. But that could soon change. On October 1, 2014, a deadline for ACP states to sign up to EPAs with the EU expires. Those countries that haven’t signed up will have to pay levies on the goods they export to the EU. Yet in spite of this threat, Namibia’s trade and industry minister, Calle Schlettwein was reluctant to agree to an EPA. "There is the assumption that we are at the same development level," he told DW in May. "We cannot go into an agreement where our ability and our policy space, which we need to develop capacity, is eroded away." Schlettwein said European nations want to be able to export their wares to Africa without paying excessive taxes or tariffs, but this would spell disaster for sectors of African industry which are just beginning to find their feet. They just wouldn’t be able to compete with European products and this would apply to subsidized agricultural produce as well as to hi-tech industrial goods. The Namibian minister also maintained that the EU was undermining African efforts to foster regional integration. The European Commission was negotiating with loose groups of states, convenient to itself, rather than respecting African regional blocs or alliances. Schlettwein said SADC comprised a development community of 14 countries, which had ambitions to turn into a customs union, an economic union and eventually a monetary union. "Now what the Europeans did with the EPA, they said that we cannot accept SADC as a group, we think there must be four different groups within SADC that negotiate different EPAs. So we have now a de facto situation where our ambition as SADC to become a customs union is seriously compromised," he said. Schlettwein’s initial opposition to an EPA appears to have paid off because the two sides have reached a compromise. The EU and Namibia said the negotiations have been completed and Namibia wants to sign an EPA. Details have not been released, other than that Namibia will continue to protect and shield its industry. 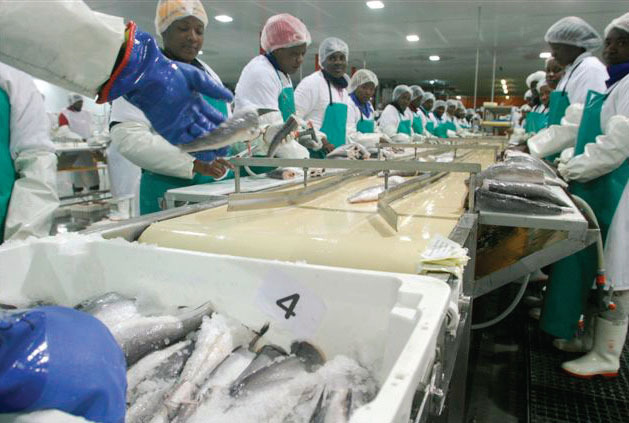 Europeans will continue to consume Namibian hake, much to the relief of the staff at the Seawork fish processing plant.